-Kill weeds in walkways. Just pour it in the cracks. -Keep pests away. Sprinkle some in the soil in your garden (NOT directly on the plants) to keep bugs and rabbits away. -A natural fungicide. Mix 1 tsp baking soda into a gallon of water and spray on roses to prevent black spots. Remove stickers and residue from glass by soaking the area in vinegar, then scraping the sticker away. Clean your coffee pot. Use equal parts vinegar and water and run a brew cycle (without a filter or coffee of course). This will clean the inside of your machine of mineral deposits and build-up. Remove caked-on food from pots and pans. Just fill the item with hot water and add a unused dryer sheet; allow to soak for several hours, then clean as normal. Pick a scented dryer sheet you love and use it to deodorize. Place an unused sheet or two anywhere odors abound–shoes, under car seats, gym bag, diaper pail, etc. 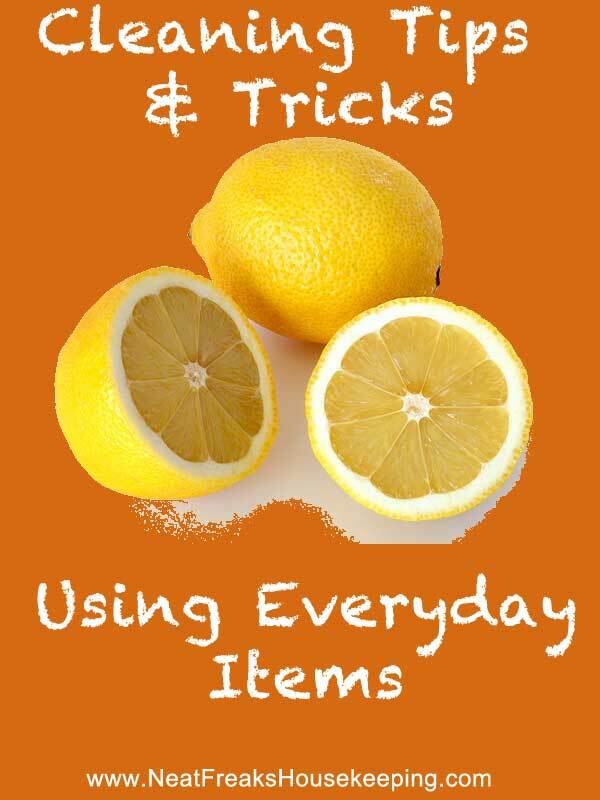 Cut lemon into small pieces and run garbage disposal. This will clean the blades and deodorize. Rub a cut lemon on bath and shower fixtures to remove hard water stains and mineral deposits. Make vinegar ice cubes and grind them occasionally. Your dishwasher is also a germ festival so put 2 cups of vinegar in it and run it on a full cycle. To make your dishwasher smell good use SUGAR FREE powdered lemonade and run it through. If you use the sugared kind it will feed all the bacteria in it! Mattresses and pillows harbor dust, dust mites, dead skin cells, and bacteria. An easy way to clean them is with your vacuum. Run the vacuum over your bare mattress and pillows with the hose attachment. Dirty fridges harbor harmful bacteria (think salmonella) as well as expired foods that can lead to food poisoning. At least once every other month, you should clean shelves and drawers with anti-bacterial cleaner as well as go through the contents of your fridge and discard anything near or past its expiration date. Subscribe to our updates for more tips and tricks to keep your household running smoothly. With kids and pets in our home, we sometimes have unique cleaning needs and the Neat Freaks crew will always accommodate our special requests. They’re great! Every cleaning is the best cleaning! Over the years, I have had more housekeeping services than I can count. They always started out good but after a few months, the service begins to suffer. CHOOSE NEAT FREAKS HOUSEKEEPING FOR YOUR MOVE OUT!! “Thank you so much, Neat Freaks, the job last Thursday was beyond amazing! I came home and it looked, smelled and felt wonderful! I fell really behind with the holidays, flu season and then a new job. You guys are awesome!” Thank you! Amy is fast, thorough, and professional – she does a fantastic job at keeping my house in shape. Can’t go wrong with Neat Freaks, I highly recommend them. Their attention to detail was impeccable and very much appreciated!